The English Canadian Edition provides a card that explains why a Canadian might appreciate some Canadian content cards and to selectively remove some of the more specifically American references from their deck for play. A second card lists some of these very overtly American cards and while many of the included cards are essentially duplicates of the American cards they are replacing, some provide entirely new hilarious content that is very valuable to Canadians playing this game. 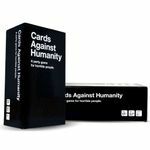 The Canadian edition does include ALL the cards from the original Cards Against Humanity edition plus this Canadian Conversion Kit adding these necessary additional cards.